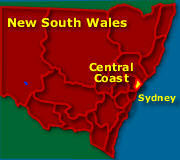 Map - See Central Coast Map NSW. Close to Newcastle, with Sydney only 88km to the south, the natural beauty of the Brisbane Waters and nearby beaches has made Gosford popular for both residents (many who work in Sydney) and visitors. Gosford city is on the Brisbane Water, nearby the Brisbane Water National Park. Nearby Bouddi National Park has good swimming and fishing at its many beaches. There are wildflower displays at Popran National Park, or visit the Ettalong Markets for bargains. See the many snakes, kangaroos and other native wildlife on display at the Australian Reptile Park, regarded as one of the country’s premier attractions. Or go sailing, cruising or houseboating in the Brisbane Waters. There are a number of events there every year, the 3 day CoastFest is one, featuring a number of Australia’s best and most talented Folk, Blues & Roots, World and Alternative musicians. It also celebrates Art & Culture including dance, theatre, visual arts and crafts of the Central Coast. In October, there is the Kincumber Festival with market stalls, buskers of all kinds, various historical tours, an Art and Culture concert, a Youth Band concert, an animal pet farm, good food and rides as well as the bush fire brigade on show. The drive there is normally quick, except maybe early Friday evenings when other people are heading to the popular north of Sydney for weekends. Take the F3 expressway from North Sydney to the turn-off for Gosford, then on to the Pacific Highway. There is a good train service from Sydney Central Station via Strathfield and Hornsby to Gosford, with a variety of combined rail/coach fares to various other points on the Central Coast. Interstate coach lines stop there as well. Cosmopolitan in nature, Terrigal is a pleasant place to visit - do not miss a visit to The Skillion (see photo) Aboriginal for "place of little birds". Nearby, there are beautiful coastal lookouts, national parks and a green rural hinterland to explore while the Bouddi National Park has beaches, forested hills and cliffs for a enjoyable day out. There are plenty of bushwalking opportunities or for just sauntering down the beach. The waterways of Brisbane Water as well as the nearby Hawkesbury River can be another great way to relax. There are ferry services and cruises operating regularly around the Brisbane Water. There are reef and game fishing cruises as well as whale watching cruises during the season that depart from Terrigal. The Skillion, known as Broken Head, lies just over the hill from the main shopping area. It is a short but steep walk to the top, but the the view is well worth it. Great for boating and fishing. Part of the city of Gosford with excellent views of Brisbane Water. Woy Woy is on a peninsula between the Brisbane Waters and the Brisbane Waters National Park. The Entrance is famous for its pelicans. But it also has deep blue waters, wide beaches and good fishing. 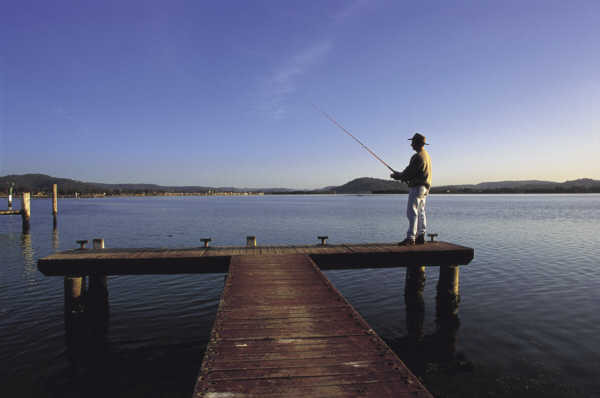 Attractions - the Tuggerah Lakes, pelicans fed daily at 3.30pm, shopping, boat hire, fishing, markets, entertainment, numerous bike paths and excellent surf beaches. Bouddi National Park with its small but beautiful beaches, surrounded by forest and cliffs. Some good fishing here, but some areas are protected. Good car camping facilities at Putty Beach, while backpackers can escape it all at Little Beach. Brisbane Water National Park is noted for its aboriginal art. Excellent forest walks throughout, with water views from Warrah Trig and Staples Lookout. Kayaking, swimming, fishing, its all good. Popran National Park is marked by spectacular sandstone cliffs and gullies. Spectacular ocean and surrounding country-side views at Mt. Olive and during spring, wonderful wildflowers. Aboriginal art abounds. Great bushwalking and mountain biking, but no camping is allowed. Munmorah State Conservation Area has some 12kms of spectacular rugged coastline. Minimum impact camping and hiking is permitted. 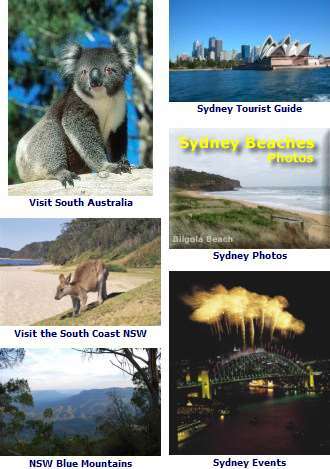 The Gosford Visitor Information Centre is a vitual repository of tourist information for the festivals, places to visit, beaches, attractions and things to do while on the Central Coast. Find out more, call 1300 132 975 or visit them at 200 Mann St., Gosford. New South Wales Central Coast accommodation has luxury hotels and resorts, self contained apartments, bed and breakfast, motels, resorts, as well as plenty of choices in caravan parks and camping. View NSW Accommodation.